But serious questions are being raised as to whether these horses are, in fact, estray or feral. After investigating the history and location of the Pilot Valley area, wild horse advocates found Pilot Valley sits at the edge of a known wild horse territory called the Toano Wild Horse Herd Area. BLM wanted to make this area “horse free” in 1993, but according to BLM’s Program statistics, approximately 168 wild horses were reported as still residing in the Toano range as of last year. 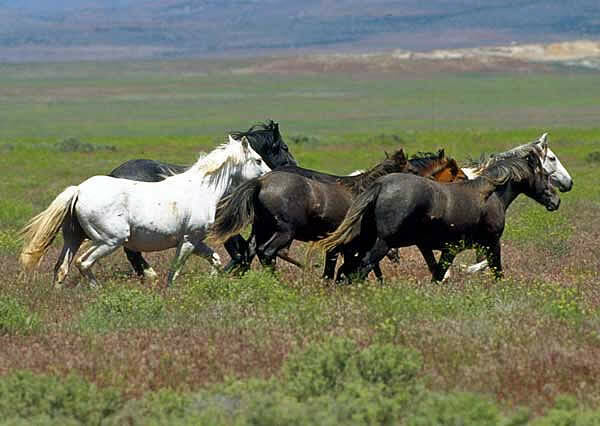 The proximity and near identical number of horses has lead mustang advocates to speculate that the horses the BLM rounded up as estray might actually be wild horses from the Toano range that are entitled to roam free under federal protection. How, they ask, does BLM know these horses are estray or feral and not wild horses? Suspicions are further fueled by the unusual suddenness of the roundup, just 48 hours after notice of the removal was posted. “These horses will go from free roaming to sold in fifteen days or less with tight security at the facilities where they are now being held,” said Valerie James Patton, Vice President of Equine Welfare Alliance (EWA). “Another concern is, there are very specific definitions as to how to determine estray and feral livestock from federally protected wild horses and so far, the only thing we’ve seen is a take-our-word-for-it position from officials,” she said. In fairness to the BLM, EWA contacted them on July 1, to ask how they determined the horses were estray and is still awaiting a response. EWA calls for a federal investigation to find out how BLM determined these horses are not the federally protected wild horses from the Toano range, which should include genetic testing and an accounting of the Toano wild horses. Animal Law Coalition is a coalition of pet owners and rescuers, advocates, attorneys, law students, veterinarians, shelter workers, decision makers, and other citizens, that advocates for the rights of animals to live and live free of cruelty and neglect.